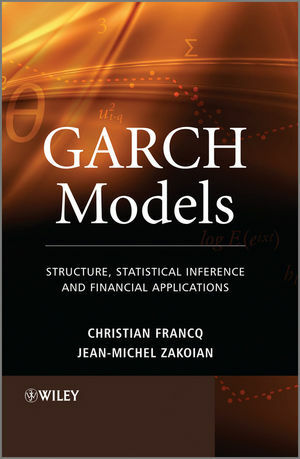 Provides up-to-date coverage of the current research in the probability, statistics and econometric theory of GARCH models. This authoritative, state-of-the-art reference is ideal for graduate students, researchers and practitioners in business and finance seeking to broaden their skills of understanding of econometric time series models. Christian Francq, Professors of Statistics at Lille 3 University, France. Jean-Michel Zakoian, Researcher at CREST (Centre de Recherches en Economie et Statistiques, Paris). They have both published various papers on this topic in statistical and econometric journals, including Econometric Theory, Journal of Econometrics and The Journal of the American Statistical Association. 5.2 Identifying the ARMA Orders of an ARMA-GARCH. 5.3 Identifying the GARCH Orders of an ARMA-GARCH Model. 7 Estimating GARCH Models by Quasi-Maximum Likelihood. 7.2 Estimation of ARMA-GARCH Models by Quasi-Maximum Likelihood. 8.1 Test of the Second-Order Stationarity Assumption. 8.2 Asymptotic Distribution of the QML When θ0 is at the Boundary. 12.1 Relation between GARCH and Continuous-Time Models. Author website Visit the author website to see data sets and programs related to this book.